If you’re a little bamboozled by the term ‘360 degree branding’ then let me explain what it is in normal speak instead of online jargon. 360 degree branding is, essentially, making sure your branding is represented at every customer touch point. From that very first email, right through to your blog, your branding needs to be visible on all your marketing. Why? Well, for a start branding encourages and improves recognition. We all know the Amazon smile, the Coca-Cola colours and – like it or not – those golden McDonald’s arches, don’t we? Branding also builds up an element of trust in the marketplace, and loyalty; who wouldn’t choose to work with or buy from a slick, well-presented brand as opposed to a less polished one? If you’re looking for new customers or word of mouth referrals, a strong brand presence can help you get both. Your whole customer experience (helped along by your branding) will ensure that you make and leave a great impression, and your reputation will start to grow naturally. Good branding will also establish you as a leader in your field, and inspire/motivate your employees or freelance staff. And please don’t think that branding is just for the big global names, either. If you want to become a profitable, leading company you need to build a strong brand from the outset. So is branding just about a fancy/memorable logo? No, it isn’t. It’s about so much more than that. Branding includes elements of colour, a certain language style, a distinct kind of imagery/photographs and even stories (about your company/your journey) – all of which need to be evident in every area of your marketing. Make sure your branding is used on your cover headers and keep your imagery consistent so people are in no doubt when they see a meme that it belongs to you. Splash your signature colours and your logo onto any imagery so that anyone who shares it will see it and know where it originated from. Use a certain kind of language and tell/reinforce particular stories throughout your social media and it won’t take long for your brand story to get established and associated. 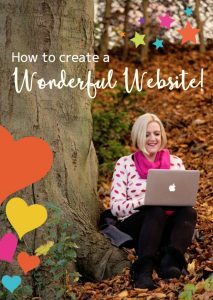 Your website is your shop window, your hub, and THE place where many people will make an instant impression of you and your brand. As such, your colours and logo need to be visible throughout, the content needs to be full of your characteristic language or words or phrases or the friendly chat you’re renowned for, and your images/photographs need to be consistent so your visitors become familiar with what your brand represents. This will encourage anyone who has already started to notice your brand on other marketing platforms, to begin building up those all-important know, like and trust feelings. Whether you’re sending out a regular newsletter, a short and sweet email, or you’re creating a sales funnel, your brand colours and logo need to be on every bit of communication you share with your crowd. Over to you. Take a good look at your online presence and see whether you’re hitting the spot with your 360 branding or it could do with some improvement in particular areas. I hope that’s helped clear any fog around the concept of branding, and the 360 approach, and that you can see why strong branding is so important for your company (regardless of size) at every customer touch point. If you’re thinking of upping your game, branching out online, and you need some expert help without all the cold, hard jargon, then please do get in touch. A lady like you deserves to have a website and online presence that not only looks good but also ‘works’ for you and your business! In 7 action-packed days I am going to help you take some essential new steps that will make a real difference with your website and social media. I’ll show you how to create a big impact with your online marketing and get you and your business seen online! Each day I’ll share a super valuable lesson in online marketing that you can take away and implement straight away!